1. Put all the ingredients apart from the port in a large pan. Wrap the star anise and cardamom in a piece of muslin or cotton, if liked, so they are easier to remove after cooking. Bring to a simmer and cook over a low heat for about 2½ hours, adding the port after 1½ hours. Stir occasionally, but more often towardsthe end to prevent it from sticking. 2. The chutney is ready when the liquid has reduced and only a small amount of sticky syrup surrounds the fruit (it will thicken as it cools). To check, run a spoon across the top – it should leave a trail and no excess vinegar should run into it. 3. 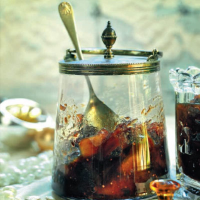 Discard the spices and fill sterilised jars with the hot chutney. Leave to cool and store in the fridge for up to one month. Adapt your favourite fruit cake recipe to finish up any dried fruits. You may find yourself creating a lovely new version to which you return again and again.